Regular servicing helps to maintain the performance of an alarm system. Vigil Security Systems provide alarm maintenance services. It is important to have your intruder alarm system serviced at least once a year. Regular servicing of an alarm system ensures the system’s reliability and durability. Most insurance companies require evidence of alarm system installed and maintained by an approved company. What Alarm Servicing Is include? One off alarm servicing (no service contract) start from £72 inclusive of VAT plus replacement parts as required. One off alarm servicing (no service contract) start from £72 inclusive of VAT plus replacement parts and battery’s as required. One off alarm servicing (no contract) start from £78 inclusive of VAT plus replacement parts as required. Call Out charge from £78 inclusive of VAT plus parts and labour as required. Monitored alarm is more than just a burglar alarm, it can generate police response. 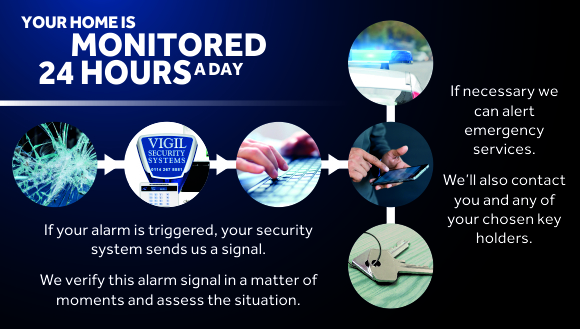 Vigil Security Systems know how important it is to protect your home and your family or business at all times – that’s why we recommend 24 hours a day monitoring for our range of house alarms and business security alarms. Alarm monitoring service ensures that your intruder alarm won’t be ignored. This is because you’re connected to our NACOSS Approved Alarm Receiving Centre via your phone line, giving you added security, 24 hours a day. What’s more, you’re not just protected from burglars; we also help you obtain emergency support when faced with a fire or if you need the assistance of a key holder. Your home or business will be monitored by our central station 24/7 around the clock. Monitored Alarm which holds a valid Unique Reference Number (URN) will qualify for Police response. The Police will no longer respond to a bell-only alarm, unless there is additional evidence of a crime being committed. A ‘Personal Attack’ signal from a monitored alarm will be immediately policed, knowing that help is on its way. Smoke Alarm and Carbon Monoxide Detector, when linked in to your monitored alarm system enable the central monitoring station to call the Key Holder. The Fire monitoring part of the alarm system stays ‘set’ even if the main intruder alarm is not ‘set’. Most insurance companies recommend monitored alarm – PD6662:2010/BS8243:2010 compliant. Redcare gsm means double protection for added security. Redcare continuously checks that the phone line is there and active and will notify the Alarm Receiving Centre within seconds should there be a problem. Redcare gsm works by sending confirmed activations over the phone line, the radio network or both to an Alarm Receiving Centre. What is Redcare home monitoring? Redcare home monitoring is BT Redcare security designed for home use. Unlike Digital Communicator, Redcare home will be able to transmit alarm signals to the Alarm Receiving Centre even when the telephone line is cut. Redcare home monitoring helps to safeguard your investments in your home 24 hours a day without the need to worry about what happens if burglars cut the phone line? Redcare gsm is able to deliver alarms even if one or both of the signalling paths are lost. Redcare is recommended as preferred choice of alarm signalling by the insurers. You need a BT land line in order to get redcare alarm signalling installed in your home or business premises. Your Redcare system will need to be installed by a professional alarm installer who should be a member of a recognised security inspectorate, such as NSI or SSAIB. Your Redcare installer should be able to supply you a complete quote for redcare, including installation, remote monitoring and maintenance. Vigil Security Systems is an approved BT Redcare installer. We can help you through the process of getting redcare, from security survey to the installation and maintenance of the redcare system. To find out more about BT Redcare for your home security or business security, please contact us.